For nearly 150 years, Sherwin Williams has been an industry leader in the development of technologically advanced paint and coatings. As the nation’s largest specialty retailer of paint and painting supplies, Sherwin Williams is dedicated to supporting both do-it-your-selfers and painting professionals with exceptional products; resources to make confident color selections; and expert, personalized service that’s focused on your unique project needs. 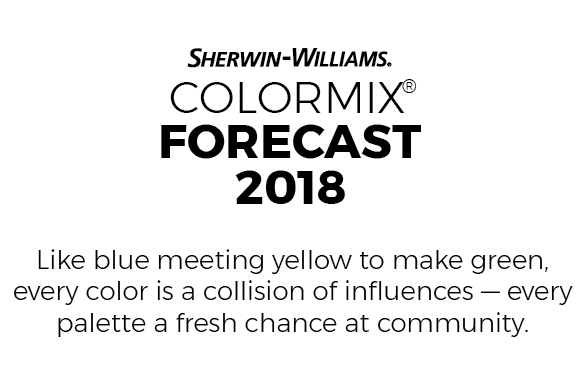 The Sherwin-Williams Company (Cleveland) has unveiled its 2018 Colormix Color Forecast, which exhibits three palettes of 12 different shades that the company maintains draw from emerging global trends. The three palettes (Sincerity, Affinity and Connectivity) aim to “drive conversation and inspiration” and draw from influences in fashion, nature, pop culture and global design.